Adding to the growing list of resources to provide to associations for cross-ice and half-ice programming, Hockey Canada has released a video highlighting a half-ice hockey game in action. The video further supports coaches and administrators in carrying out Programming Novice and Below. 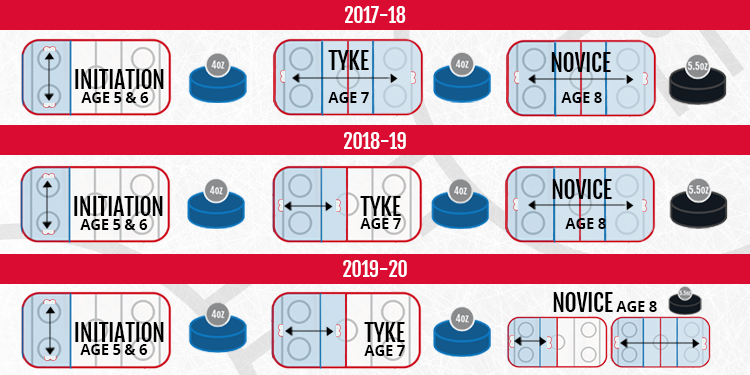 The rollout plan that started this past season will take continue to take place next year in Tyke and in two years in the Novice age group. Limited whistles and rules emphasis in the programming allows players to stay involved and engaged in the play. It puts the focus back on the physical literacy part of movement skills while introducing the basic, fundamental technical skills specific to hockey. In the video, the rink is setup with dividers that split the ice surface into two. It explains how to utilize nets and benches and maximizing space and use of the ice. The basic rules, including the division of playing time, are also shown. There is a referee on the ice keeping an eye on the play and the video explains how to call penalties and what to do when the puck is frozen or a goal is scored. Since there is no offside or icing called, the action is always flowing and the players remain engaged throughout. The video is a great visual resource that goes hand in hand with the Programming Novice and Below Implementation Guide. Seasonal structure, game format and gameplay guidelines are all detailed in the guide and the video helps show gameplay in-action. Learn more about it here. 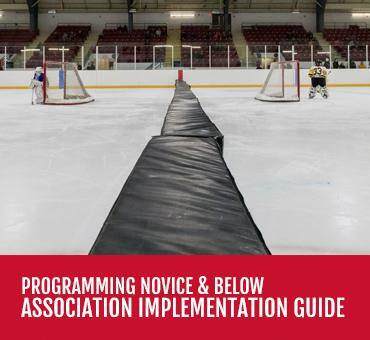 Earlier in the year, three leaders in minor hockey discussed the changes to Programming Novice and Below to explain the background behind the decision of the nationwide initiative that will see more kids at younger ages playing and practicing hockey in age-appropriate programming. Associations from across the OMHA have already seen the benefits of this new programming and notice an improvement in their players. Practices and game play are designed to be appropriate to the age, size and skill level of the participant and offers many benefits. An increased emphasis on skating skills boosts agility, balance, coordination and quickness while the number of puck battles rises. Players receive twice the amount of puck touches and double the number of pass attempts, shot attempts and changes of direction. "We want to give the right start to our beginner or introductory hockey players in terms of the ability to enjoy the game." The OMHA and Hockey Canada will continue to provide resources to assist coaches and associations in the delivery of age-appropriate programming. The OMHA strongly believes in the benefits that cross-ice and half-ice hockey have to offer and look forward to continuing to ensure the best hockey experience for players. Designed specifically for the game's youngest players, the Programming Novice and Below curriculum introduces players to the fundamental skills of the game. Skating, puck control, passing and all taught in an in age-appropriate setting so players can have fun and want to continue to play the sport.